I love the landscapes of Kurt Jackson. Of the above painting he notes “Evening and two choughs fly over the sea squeaking excitedly – my first Cornish choughs” from his exhibition The Cornish Crows. populated with jackdaws, magpies, choughs, ravens and crows. More on Wikipedia on Kurt Jackson. 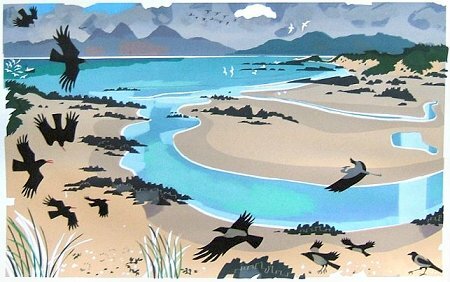 I’ve recently rediscovered the wonderful wildlife and landscape paintings by Carry Akroyd. The above work is entitled Colonsay, Oronsay, Islay & Jura, though most of her work is centred on rural England. Lots more of her work here at her website. “Quintessentially English” is how Constable’s landscapes are frequently described. It’s a source of quiet satisfaction to the painter’s most nationalistic fan base that he was happy to live his life entirely in England, never crossing the Channel, even though his work was much more enthusiastically received by French critics. Born in East Bergholt, Suffolk, Constable even found the dramatic landscapes of the Lake and Peak Districts too foreign. Rather than mountains, he was inspired by the vast skies of the East Anglian flatlands where he grew up. The management of London’s biggest park (790 acres/ 320 hectares) involves balancing recreational activities with nature conservation. Stressed out city dwellers can relax in a rural landscape, composed of a rich variety of habitats, including meadows, where grass is allowed to grow long to favour butterflies, and woodlands, where all three of Britain’s woodpeckers nest. Outdoor swimming is a popular activity on the Heath, while by one of the 25 ponds a bank has been constructed to encourage kingfishers to breed. Up on Parliament Hill kite-fliers enjoy spectacular views of London and might also see Kestrels and Sparrowhawks hunting. Is it possible to do anything new in the twenty-first century in landscape painting? Although most of the art world has given up painting hills, fields and trees, David Hockney doesn’t agree and returned to his native Yorkshire to paint a series of works of the countryside he knew as a child and teenager. Pagel, David. “The view from the woods. David Hockney’s East Yorkshire landscapes make Cézanne look Pop” Los Angeles Times, Around the Galleries, 16 February, 2007. Muchnic, Suzanne. “Landscape perspectives. David Hockney rediscovers the landscape of his youth and his celebrated countryman, John Constable.” Los Angeles Times, 11 February, 2007.